Lucky Little Gods slot is a clone (copy) of an extremely popular Microgaming 243way game over 5 reels and 3 rows, called ‘Bust The Bank’. 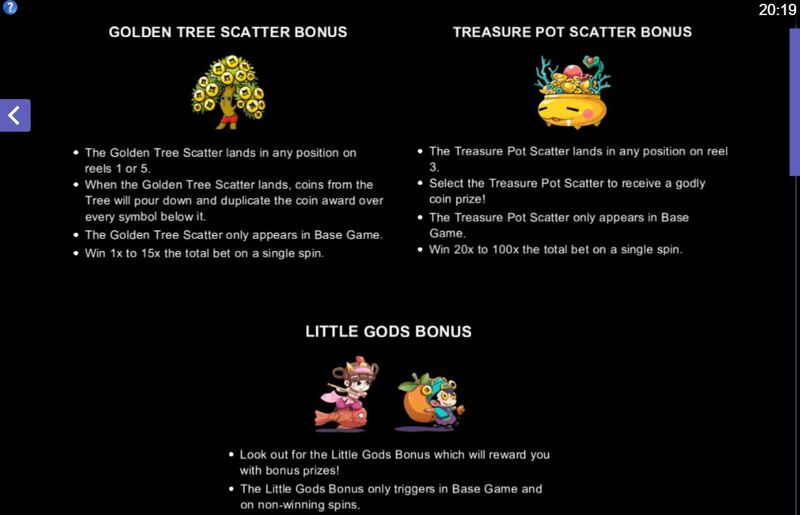 It has Wilds featuring on all reels and 2 in-play features which are: a Golden Tree Bonus which occurs when one or both of reels 1 and 5 have a treasure tree landing. 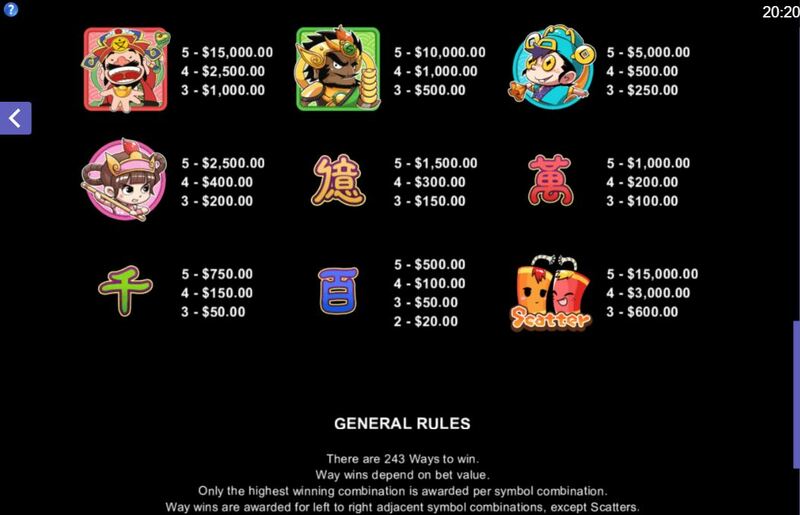 It will open and pay an award, which will then be repeated on any symbols below it, so it’s best if it lands on the top row. You’ll only win up to 15x bet on this though as each position can only pay a maximum of 5x stake. A Treasure Pot bonus if it should appear on reel 3 awards a slightly more attractive 20-100x bet though! After any losing spin you may find you are randomly awarded a coin prize by a Little God appearing on this infantile-themed slot. Three Twin God scatters anywhere in view will trigger 8 free games with reels 1 and 5 locked as stacked Wilds. 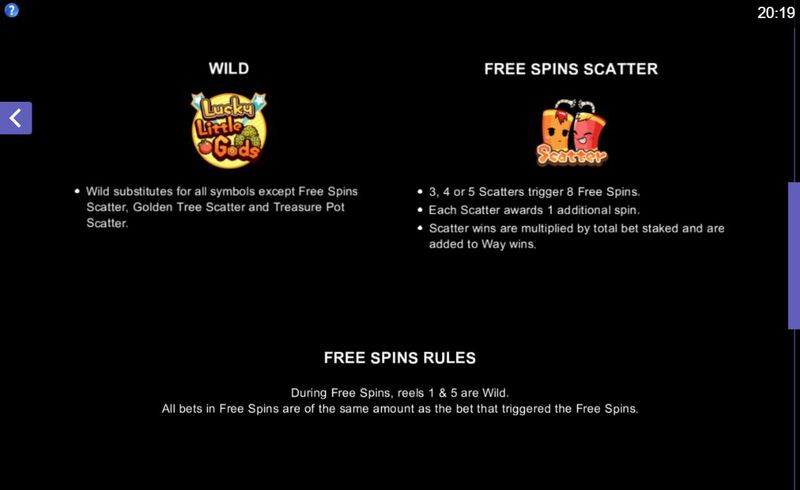 You can’t retrigger but any scatter appearing will add 1 extra free spin. Quite a lucrative bonus round if you see a similar symbol, or even 2 at once, land on the centre 3 reels as you will have 9x 5-of-a-kind wins guaranteed. 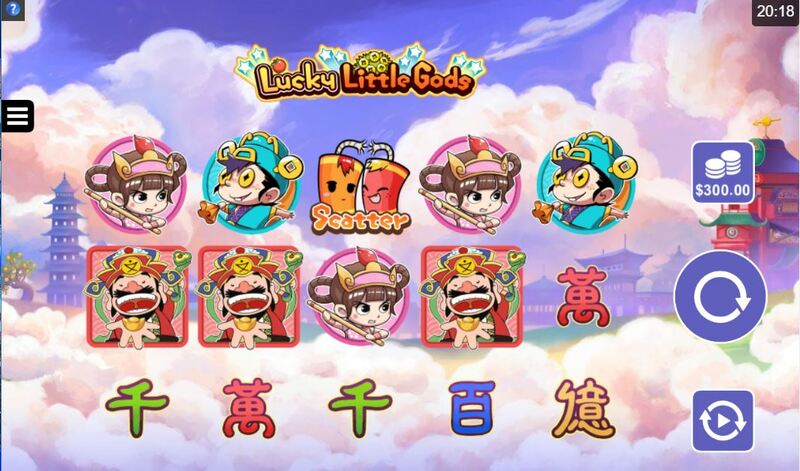 The RTP of Lucky Little Gods slot is 96.75%.